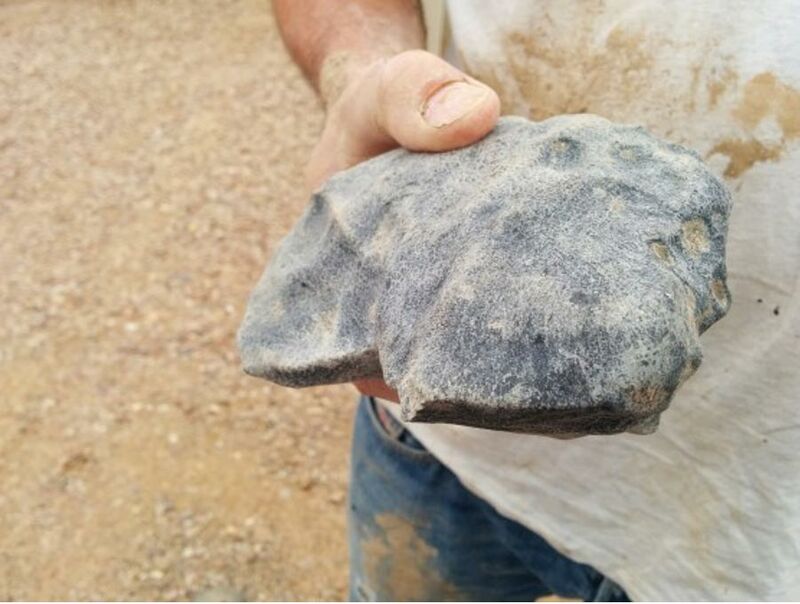 A meteorite that is older than Earth itself was recovered from Kati Thanda – Lake Eyre in South Australia, just hours before heavy rains would have washed away all trace of it. The retrieval of the estimated 4.5 billion-year-old meteorite, which fell to Earth last November from an orbit between Mars and Jupiter, has been described as like finding a needle in a haystack. Kati Thanda – Lake Eyre is normally dry, but is now being filled by heavy rains, a rare event that occurs just several times each century. A press release from Curtin University reports that the 1.7 kg (3.7 lb) meteorite made from material created during the early formation of the solar system, plunged to Earth on 27 November, and a team from Curtin University had been trying to track down the fall site ever since using a new observation network of 32 remote cameras called the ‘Desert Fireball Network’. Having narrowed the search area down to a 500-meter (1640.4 feet) line, the team finally converged on a spot in the lake bed of Kati Thanda – Lake Eyre on New Year’s Eve. Around 40,000 years ago, South Australia’s Kati Thanda – Lake Eyre, which forms the lowest point in Australia at 16 meters (52.5 feet) below sea level, was an enormous freshwater lake brimming with life. However, about 20,000 years ago, the climate became drier and the rivers and streams that fed the lake began to shrink. Today, it is a dry salt lake in one of the world’s great arid regions, as well as a great playa lake - a lake that occasionally floods. When it is dry it is the biggest salt plain in the world. When it is wet, it becomes Australia’s largest lake. The last time it was full was in the 1970s, but now the lake is filling once again as heavy rains relentlessly fall across the region. The BBC reports that the whole area is coming back to life – creeks and streams are flowing into the basin and the lake is now surrounded by a fresh burst of green vegetation. In 1840, famous English explorer Edward Charles Eyre set out to explore the interior of South Australia and became the first European to spot the region surrounding Kati Thanda - Lake Eyre, including Lake Torrens, a southern arm of Lake Eyre. He described the hot, dry, and arid interior as “Hell on Earth”. Eyre reported an uneasy feeling about the lake, describing it as “glittering and brilliant beyond conception”, but in a “region of magic” where all was "uncertainty and conjecture". The Aboriginal people also feared the Lake, perhaps due to their legends of the Kudimudra, a bunyip-like creature which was believed to devour anyone that wandered into it. The lake became known as ‘Lake Eyre’ after Edward Eyre’s discovery. However, in 2013, the lake was officially renamed as Kati Thanda – Lake Eyre, to honor its ancient origins and importance to Aboriginal history. Featured image: Meteorite recovered from Kati Thanda – Lake Eyre. Credit: Curtin University .